Introduction - Melvyn Thompson writes: In comparison to the present day era of the motor car, technology and life's essentials, life in Woodborough as a child and teenager during the 1950's and 1960's could not have been more different. I was aged nearly 5 before we had a very small black and white television purchased especially to view the Coronation in 1953. Then the village literally straddled Main Street, Lowdham Lane, Shelt Hill and Roe Lane. The population was considerably smaller, at a guess, around 7 to 800. It is only over the last 40 years that the village developed from a small closely knit community with the majority of basic services being contained within the village. By comparison to the present day the village has become a residential commuter settlement with considerably fewer services. Now sadly the garage, Old Co-op, newsagent and Post Office have all closed [by 2015]. As a teenager delivering newspapers in the early 1960’s, I probably knew almost every family in the village and certainly knew when to be wary of those households with a lively dog - I shall not name them! Needless to say I did receive the odd nip on the ankle whilst running to exit their garden gate. Woodborough Woods Foundation School - 1953 to 1960: In the 1950’s the majority of children walked to school from most areas of the village, they were safely guided across Main Street to and from Lingwood Lane, near the old Post Office, by Emily Harrison. Starting school in 1953, my first teacher was Miss Harvey who lived in Calverton then Miss Smith from Lambley taught me at the next level class. The Headmaster, Mr George Sinfield, taught the older children including myself at the senior 11 plus level. In my year age group I recall that there were only around 8 children and I am guessing, probably no more than 80 to 90 children in the whole school. At Christmas the sliding glass partition between class 1 and 2 was removed and a large Christmas tree set up. Our class made decorations for the school; I particularly remember making our own decorations including paper chains which were strung across every classroom. In wintertime, our one third pint bottles of free milk were often frozen and the metal crates were placed in front of an open fire for the bottles to thaw out. School meals were delivered by a van each day from an external site to the kitchen at the rear of the school and then served to the children from the insulated containers. 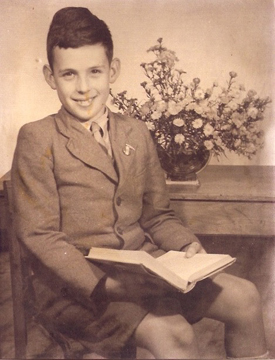 Left: Melvyn aged about 9 in the late 1950’s. The present school now has considerably more pupils and during the 1980’s my mother Sylvia Thompson was a dinner supervisor, some villagers may remember her. Pupils were made monitors and given various tasks such as being a milk monitor or ringing of the School Bell in the Entrance Hall. Being a Church of England school there was and is a focus on nearby St. Swithun’s Church. A number of Religious events were celebrated with some services being held in the Church. In the 1950’s there was a strong emphasis on the three R's, reading, writing and arithmetic, together with history, geography and scriptures. We were often taken on nature walks in the surrounding farmland exploring the hedgerows and ditches for wild flowers, insects etc. Arts and crafts were carried out in an annex overlooking the infant’s playground at the rear of the school. The school had three “houses” Oak, Ash and Elm, particularly relevant for Sports days, which included ‘novelty races’ such as egg and spoon races, three legged races and sack races. Before the construction of the first football field on land adjacent to Lingwood Lane, Sports Days were held on the Governors’ Field opposite the Four Bells Inn. The present school and new village hall now occupies the original football field. Gardening was encouraged - I recall collecting tools from the tool store in the rear yard at the back of the kitchen and at the end of a gardening lesson we had to ensure that the tools were put away spotlessly clean. We did not have as many out of school visits as children seem to have nowadays although I can recall a couple. We had a visit to the Natural History Museum at Wollaton Hall, Nottingham and Mr Sinfield took a group for a day trip to London by train, pulled by steam engines in those days. At Play: Our playgrounds were the village streets, the farmland, woodland and Governors’ Field, later the sports field on Lingwood Lane. After school, groups of boys would meet to play football on the Governors’ Field with jackets as goal posts. It was not unusual to have games with six to ten children each side and it was often dark when we stopped playing. Groups of children built their own 'dens' in the hedgerows, Stanley Wood, and ‘Timmies’ orchard near Sydney Terrace off Field Lane which was owned by Tim Foster the Postmaster, or even built underground dens with an entrance through a short tunnel. 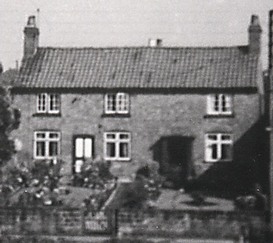 The dens tended to be as hidden away as far as possible and as a generality, they were built by groups of children living in different parts of the village such as Park Avenue, Roe Lane and Main Street around Church Walk and also the areas around the Nags Head, Shelt Hill and Lowdham Lane. There was a certain amount of competition to find other newly constructed dens. In summer children built trolleys using a set of old pram wheels, a favourite run was down Roe Hill starting near the cemetery gates and then swerving into the Four Bells car park in order to stop before reaching Main Street at the bottom of the hill. In winter sledging was commonplace and I particularly recall the long cold winter of 1963 when we were sledging for almost two months. The best track was through Stanley Wood which started at the top of Jack Kirkham's field, over a sharp bump and down a hollow near the bottom of the field, then through a gap in the fence into Stanley Wood and with enough speed, snow conditions permitting, the run ended at the bottom of the field at the rear fence of Woodborough Hall. We would link a number of sledges together to form a train, although very few reached the bottom of the field as the trains broke up very easily. In the dark winter nights, Park Avenue and Roe Lane became reasonably well lit icy sledge tracks. We would play in the village 'dyke', which ran the whole length of Main Street before it was later piped into a culvert. We made dams, although it was in effect quite a polluted stream in those days with very few fish and quite a lot of red worms! From time to time, the 'dykeman' as we used to call him, although I think his name was Mr Knight who lived in Calverton, cycled to the village on his ‘Co-op’ style delivery bike with his tools in a basket at the front; he cleared the vegetation from the dyke along Main Street. As in recent years, flooding was also commonplace in the 1950’s. I recall on one occasion large stretches of Main Street being totally flooded and people were canoeing down the street. Another attraction for children in those days were the streams on Shelt Hill, The Dover Beck and the streams running from the trout hatchery on Moor Lane, which were good for collecting frogspawn and fishing for minnows, sticklebacks, bullheads and the occasional trout. Bonfire night parties on the 5th November were organised by individual groups and families rather than arranging a single village bonfire as in the present day. It was a major task to collect wood, newspapers, cardboard etc. from throughout the village. Health and Safety was on the distant horizon in those days, we were extremely lucky not to have been burnt or injured from throwing fireworks, including jumping jacks and '3d bangers' few restrictions applied to the sale of fireworks then. I remember bonfires at many locations including New Row, Sydney Terrace off Roe Hill, and Church Walk opposite our cottage, also Shelt Hill and Lowdham Lane and the field at the top of Park Avenue. As children we were fearful and also respectful of Police Constable Stowe from Lambley who patrolled Woodborough on his motorcycle. I remember as a young boy, him taking me home on one occasion because we were playing football on the Main Street at the bottom of Church Walk. He also regularly confiscated any homemade catapults he found. Another childhood activity, which is now fortunately illegal, was the collection of bird’s eggs by taking them from nests. Being brought up in the countryside we learnt to respect from an early age the rules of farming, fishing, hunting and shooting for the protection of crops and animals. Bill Alvey the Cobbler on Main Street was a very good friend to boys as he was often asked to stitch the seams in our old-fashioned leather footballs and replacing lost studs in our football boots. During the summer in our younger days before and during our early school years mothers and children would walk over Roe Hill on the Bridle Path past the Cemetery to Springwater Lido at Calverton. I recall going with my mother, Sister Brenda, my Aunty Kit, Cousins Raymond, Sheila and Christine, Mrs Rice and her daughters Frances and Heather. The name ‘Springwater’ was well founded as the water was freezing! When older, we would cycle to the Lido without our parents. In April 1954, Princess Margaret made a visit to Calverton Colliery. Her route was from the Epperstone Bypass and along Moor Lane. A group of mothers with children walked from Woodborough over Grimesmoor to Moor Lane to glimpse a sight of her passing in the car. Anecdotally, I have been told that we were standing by the bridge and water splash on Moor Lane. I recall the demolition [mid 1960’s] of the cottages in Sydney Terrace at the rear of the Institute off Field Lane. The area became a playground for children in the empty cottages at this time whilst their demolition took place. During the construction of the new ‘Old Peoples’ bungalows the site became a haven of play after the workers had gone home for the day and clambering round the scaffolding of partially constructed buildings. Then and Now: The village in the 1950’s and 1960’s had everything to be almost self-sufficient. Harold Hill the milkman, Walter and Janet Hill the butchers, Kate and Tim Foster and then Charlie Foster in the old Post Office. My sister Brenda worked in the Post office for Charlie in the 1970’s. In another shop, Miss Freund sold wool and haberdashery plus fireworks for November 5th each year, Edwin Spencer, Cynthia Hallam and Pitwoods all providing groceries, sweets and chocolates. As children we were often able to purchase sweets etc. outside opening hours and I recall Edwin Spencer was particularly accommodating in this respect. Also, the recently closed Co-op and Post Office were the principal grocers shop in the village. Mrs Sissons ran a fish and chip shop at the end of Main Street opposite the Nags Head, selling soft drinks and Lyons Maid ice cream with a petrol pump alongside. Jack Leafe on Main Street was the village coalman and offered general transport providing house removals etc. Visiting tradesmen included Billy Leafe, a butcher from Calverton; Shaw’s who had an ironmongers shop in Lowdham selling hardware and Mr Swann a greengrocer. My late Aunt Evelyn and Uncle Ron Fairwood were establishing a builder’s merchants business in Lambley and in the late 1950’s early 1960’s, delivered logs for fuel and chopped sticks for kindling to Woodborough, Calverton, Lowdham and Epperstone. Cliff Bladon from Epperstone delivered newspapers to Woodborough but in the early 60’s the deliveries were taken over by Claude Alvey, a newsagents from Calverton. I was one of two newspaper boys and delivered to houses in Roe Lane, Lingwood Lane, Main Street plus Lowdham Lane and Shelt Hill. One particular person I recall is Walter Desborough who lived up Co-op Yard in one of the old stocking frame cottages at the rear of the former Co-op. I usually delivered his evening newspaper last at the end of my round and made sure he had coal indoors for the night. He very often chatted about village life and people of his generation, which I remember I found extremely interesting at the time, although I am afraid I can remember little of the content of these conversations. In the early days when Claude Alvey Newsagent from Calverton took over the newspaper deliveries the morning newspapers were sorted in my parent’s front room. We lived in Woodview Cottage opposite the new Co-op which was between Church Walk and St Swithun’s Church. In the evening I had to meet the Calverton bus (the 7A) from Nottingham at around 5.00pm to collect the Nottingham Evening Post and also the Evening News whilst the latter was still being printed. In the mornings during term time I had to catch a school bus to go to Carlton Le Willows Grammar School at just after 8.00am and I remember many cold dark winter mornings being woken at 6.30am to deliver newspapers, Saturday evenings during the football season meant taking out a couple of dozen Football Posts on a second delivery throughout the village. Sunday school: My mother Sylvia Thompson attended the Methodist Chapel and I went to Sunday school in the schoolroom at the rear of the Chapel. We were presented with a book each year at the Christmas Party as an award for attendance at Sunday school. As I had a stutter in those days my worst fear was having to recite a piece of poetry at the annual ‘Anniversary’ sitting on the tiered platform facing the congregation and I was very nervous. To compensate, each year the Chapel arranged an outing to the seaside, either to Cleethorpes, Mablethorpe or Skegness using Clarkes coaches from Epperstone often driven by Albert Plumb who lived on Lingwood Lane next to the Church. Also each year the Chapel attended a Festival of Queens at the Albert Hall in Nottingham. My sister Brenda and her cousin Christine were attendants to Linda Briggs in 1960’s. 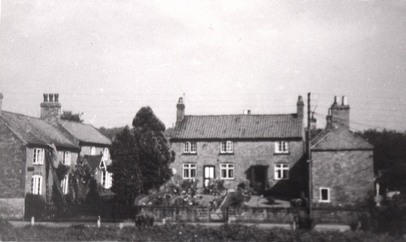 Left: Church Walk cottages and the Co-op Store viewed from Woodview Cottage. The house stands back from Main Street. Melvyn’s sister Brenda is on the lawn. The centre and right photos were taken in 1935, well before Melvyn lived there. To the left is the former Punch Bowl inn. To the right Westminster Cottage which was formerly a frame knitters house with a workshop to the rear. Scouts: During my short time with the 1st Woodborough Scouts the Scout Leader was Philip Lambert and I recall that Ian Richardson who lived on Private Road off Roe Hill also played a prominent role. We met in a first floor room at the rear of Woodborough Hall and there were two packs, Panthers and Beavers with boys also attending from Lambley and Woodborough. The scouts along with the brownies, guides and the Woodborough Brass Band before it was disbanded, took part in the annual St George’s Day Parade and the Armistice Day parade finishing around the War memorial in the Churchyard. I especially remember camping trips, our accommodation was an ex RAF bell tent, our feet pointing towards the central tent pole and sleeping on a ground sheet with no comfort whatsoever! We camped at the Scout Camp at Walesby near Ollerton on one occasion with many other Scout Troops, however our favourite site was at Edwinstowe. We camped in a field at the rear of Edwinstowe Church adjacent to Sherwood Forest, in those days we could climb the Major Oak as it was unfenced and much more accessible than it is today. The group won the South Notts cooking competition in the early 1960’s due in no small part to Raymond Thompson, my cousin, who made a career as a chef and caterer. 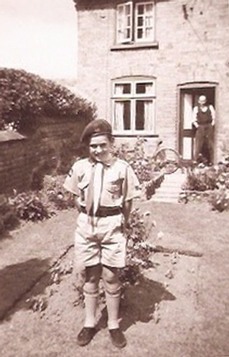 then as Woodview Cottage in the uniform of a 1st Woodborough Scout, circa 1960. Woodborough Football: Before the “new” football pitch was laid alongside Lingwood Lane the team played on a field next to Foster’s bungalow on Lowdham Lane. Walt Raynor managed the team for a number of years, on match days the ‘highlight’ for us was to shoot between goalposts with real nets once the posts and nets had been erected and during the half time interval. In 1967 as a regular frequenter of the Nags Head, a number of us decided to arrange a charity football match. We challenged the Village team, the game took place on Boxing Day 1967 and all proceeds went to Nottingham General Hospital Kidney machine Fund. Nottingham Forest FC kindly let us use one of their first team strips, unfortunately we lost. The team included myself, Roger Burton, Maurice Snowden, Robert Hallam, Richard Burton, Barry Taylor and Michael Foster. (I cannot find my copy of our team photograph and it would be good if someone has a copy). Woodborough Community Association 1969 Barn Dance: The first Barn Dance was held in Timmerman’s Rose Packing Shed and was organised by a group of people including myself and led by John Tew, plus invaluable help from Norman and Margaret Tyler and other members of the Woodborough Community Association. We asked the WCA for funds and ‘boldly’ declared that we would make a profit. I believe that we did although I cannot remember how much. We set out on the day to arrange an event that would bring in some income for the newly formed Community Association. A band was hired after visits to see them perform in Lincoln and other places in order to choose the best Band. Beer was supplied on a sale or return basis from Holes Brewery in Newark (now developed as a retail park). Marketing was extensive with fliers placed over a wide area and promotion from Radio Nottingham and local newspaper advertising. As a result I believe the evening was a great success and coincidently, I met my wife, Carolyn, at the dance and we have now been married for 44 years. Garden parties: These were held in the Old Vicarage on Lingwood Lane. I seem to recall that Kath and Vic Jamson also won a pig at a Woodborough Garden Party possibly held at the old Vicarage and called it ‘Bootiful’. (I am not sure if this relates to the story already on this website) Garden parties were also held at the Manor which is almost opposite the Four Bells, and I believe was owned by the Foster family before Jack Taylor. In 1953 the Coronation celebration garden party took place at Woodborough Hall with children encouraged to wear fancy dress – my mother made me a ‘Royal’ coat with photographs of the day which I apparently refused to wear. My mother was also skilled at making baby clothes and was frequently asked to dress dolls for raffle prizes. The RAF occupied Woodborough Hall in the 1950’s and I seem to recall that Wing Commander Douglas Bader paid a visit to the village on one occasion. Fox Hunting Meets at the Four Bells: Fox hunting was always a special occasion in the village with children congregating outside the Four Bells or Nags Head prior to a hunt. I remember one occasion when we followed the hunt from the Four Bells on our bikes and on foot, the Hunt mostly set off up Lingwood Lane, Hunger Hills and then across to Ploughman’s Wood. Very often we were not able to keep up to see the outcome! Floods: Water Mains (article 304 on this website) – I remember it being constructed from Oxton through to Moor Lane and over Roe Hill before going up Lingwood Lane to Lambley. It was good fun walking and playing on the lines of pipework and trenches. Old Village Hall, Lingwood Lane: The old parochial village hall on Lingwood Lane played a pivotal part in the life of the village. It was used as a clinic for babies and toddlers in the 1950’s; I clearly must have been taken there many times to be weighed and received orange juice or whatever we were given in those days. The school used the Hall for country dancing classes or any event requiring a larger space than the school could provide. In the late 1950’s during the winter months, I recall that films were shown with a freestanding film projector being set up on each occasion. Films I remember seeing at the time are ‘The Dambusters’, ‘Reach for the Sky’ and ‘Robin Hood’ (clearly an early version). In the 1960’s, the start of the Beatles and Rolling Stones era, the Hall was used as a Youth Club. Everyone of a certain age remembers where he or she was when President Kennedy was assassinated. 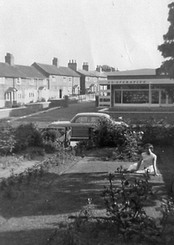 I was at a friend’s house, Roy Parr on Roe Lane waiting to go to the Friday night Youth Club. The Hall had a stage at one end and was used for ad hoc concerts. Harvest suppers and other village events were also held there. Mannie Foster: Many tributes have already been written to honour his memory and celebrate his life’s work in supporting many village people, organisations, activities and charities. As a child growing up in the fifties my fondest memory is of his ‘childlike’ enthusiasm to announce to us that the Feast was coming when the first of Oakley’s Fairground vehicles entered the village. It was a tricky manoeuvre to drive the long vehicles off Main Street and up Mannie’s Drive. In those days it was only a small fair with the Noah’s Ark (later converted to a waltzer), swing boats, children roundabout and a few side stalls. We were also amused at the very slow speed he drove his van through the village. I think it was a green Austin. Along with Kathleen Jamson and others, my mother worked for Mannie picking fruit and vegetables at busy periods during harvest time. On a number of occasions during my mothers later years, Mannie took her with him to the Heckington Show and Steam Fair as we had family connections in the village. Summary: This portrayal of life in the village as a child of the 50’s and 60’s reflects my own personal memories and hopefully it will evoke shared memories by many other people of my generation who perhaps still live or once lived in Woodborough. The final photo, taken at the bottom of Park Avenue at number 28, is of me aged 19 with my first car - a Morris Minor! Melvyn Thompson now of Kings Bromley, Staffs.